Throughout the process of coming out and living ever more openly, you should always be in the driver’s seat about how, where, when and with whom you choose to be open. 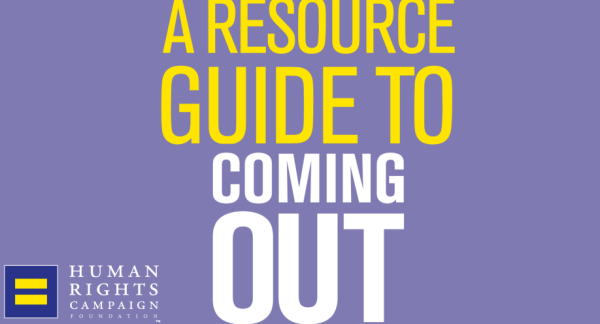 If you're wondering how to come out, this guide was designed to help you through that process in realistic and practical terms. It acknowledges that the experience of coming out and living openly covers the full spectrum of human emotion – from fear to euphoria. Whether coming out to friends, family, coworkers or healthcare providers, your approach and timing will be as unique as your own sense of identity. The Advocate's "Coming Out Stories"
Sharing a big part of who you are with other people can be exciting and tough. 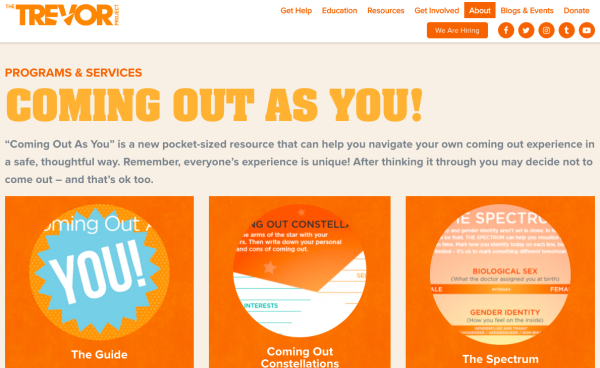 That’s why The Trevor Project created “Coming Out As You” – a guide to help you explore important parts of who you are. Inside you will find questions that many young people think about, and blank spaces to brainstorm how you might answer them. There are also two great worksheets that can help you organize your thoughts. After thinking it through you may decide not to come out – and that’s ok too. Many people choose not to for different reasons. 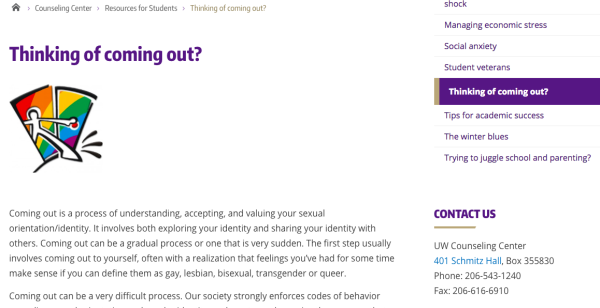 Gender Expansion Project's "Coming Out as Trans"
University of Washington "Thinking of Coming Out?" 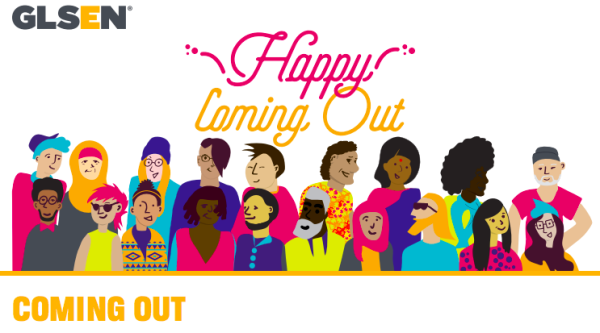 Coming out is a process of understanding, accepting, and valuing your sexual orientation/identity. It involves both exploring your identity and sharing your identity with others. 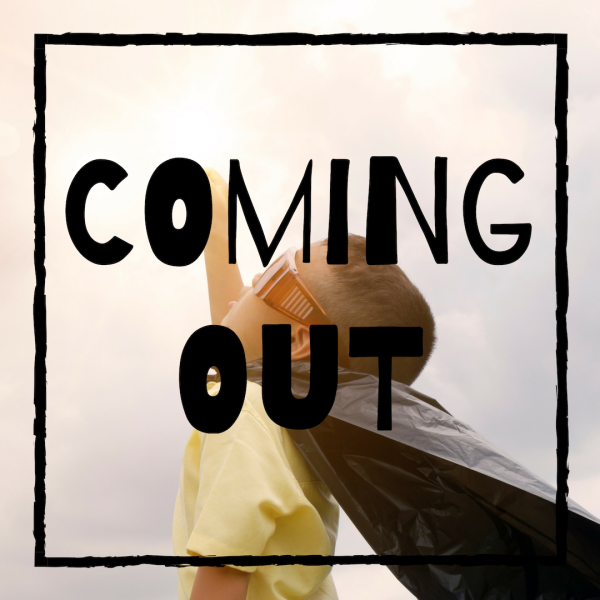 Coming out can be a gradual process or one that is very sudden. The first step usually involves coming out to yourself, often with a realization that feelings you’ve had for some time make sense if you can define them as gay, lesbian, bisexual, transgender or queer. Coming out as trans*, intersex, gender diverse or as an individual questioning their gender or where they fall within the gender spectrum can be a challenging process, and most likely will not be a one-time event. 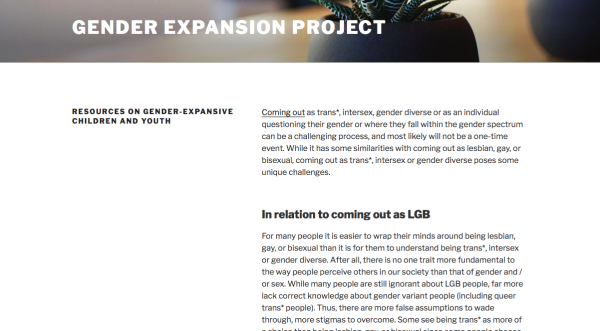 While it has some similarities with coming out as lesbian, gay, or bisexual, coming out as trans*, intersex or gender diverse poses some unique challenges.